VISALIA – It doesn’t depict your actual sofa, or any other sofa you may find in the furniture store. But, Sofa Art is back and this time it is colliding with Comic Con! 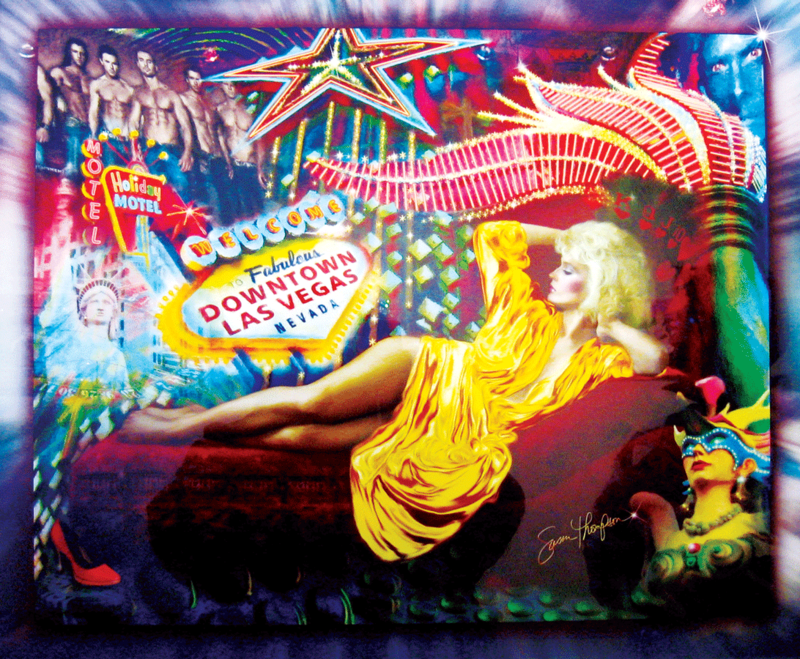 The 24th Annual Sofa Art Show opens at The Creative Center’s Jon Ginsburg Gallery on Friday, April 5 from 5-8 p.m. According to The Creative Center’s promotion of the show, “The Sofa Art Show is an annual art exhibition featuring imagery or references to sofas. Each year, it is accompanied by a different theme. The show began 24 years ago under the leadership of Varian Mace and Lucy Merritt, who were Visalian artists. As such, the show has brought local artists back time and again, some of whom have been exhibiting since its conception. “We enter because it is fun to try to create art within a theme,” said Joan Constable. “Being friends with Varian also pushed my husband and I to create for the show. Constable admitted that this year’s theme of Comic Con was a little bit out of her norm, but she rose to the occasion anyway. Constable and her husband, John Stobbe, continue to enter the show each year in part to carry on the legacy of Mace and in part they continue because they enjoy participating with the rest of the local art community. Mace also continues to enter the show, although she has moved away from the area. An article in the Arts Consortium’s Watermark, written by Christina Thorin a few years back reported that Mace was upset with a local newspaper article, “in which the author bemoaned the local art scene, stating that art appreciation in the area consisted of people buying art to match their sofa. “’I, of course, took exception to the comments, as did members of the art community. I took the article to COS the next day to share with my art students,’ said Mace. ‘This prompted a lively discussion and I decided to give them the assignment to paint a picture or create a piece of art with the one provision, it have a sofa in it. The Sofa Art show has been around for more a couple decades now. There was a brief hiatus prior to The Creative Center bringing it back a couple of years ago. Entries can be a sculpture of a sofa, a painting on a sofa, a drawing of a character on a sofa, or an abstract piece inspired by the form of a sofa. Every entry must incorporate a sofa in some way. With the theme of Comic Con, possibilities include art in the illustrative style of manga or anime, or that of Western or American comic books or cartoons. Art inspired by Pop Art or with a composition inspired by a comic book page layout are other options. If comics and/or art interest you, head to the Jon Ginsburg Gallery for the show opening. A related costume contest will take place and visitors are encouraged to vote for their favorite art entry. The show will remain on display through the month of April. The Jon Ginsburg Gallery is located on The Creative Center campus at 606 N. Bridge St. in Visalia. For more information visit thecreativecenter-visalia.org.